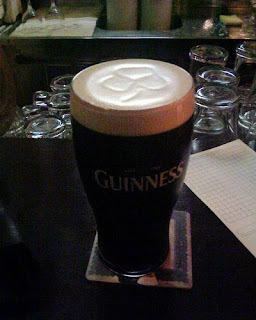 Ah, Guinness Day. I mean...*cough* St. Patrick's Day. (Or "La Fheile Padraig", if you're feeling particularly Irish.) This well-known Irish holiday is celebrated on March 17th and is accompanied by a mountain of traditions that have very little to do with it's origins. 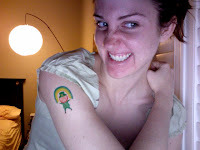 When most people think of St. Patrick's Day, they think of green beer and getting pinched. "But what's the real story?" you ask. Well. I'll tell you. St. Patrick is the patron saint of Ireland (my favorite county, God bless them all). Patrick, born Maewyn Succat, was not Irish by birth - he was the son of a Roman-British army officer and was born in either Scotland or Roman-England. However, when he was a small child, he was kidnapped by pirates and sold into slavery in Ireland. Six years later, he began to have dreams where he saw and spoke to God. According to his autobiography - "The Confessio" - it was in these dreams that God told him how to escape on a getaway ship. When he did escape, he went to Britain and then to France. There, he studied under the bishop of Auxerre as a monk for twelve years. He became a bishop, and soon began to have dreams that the Irish were calling him back to Ireland to tell them about God. So, with the Pope's blessing, Bishop Patricius (his Romanized name) returned to Ireland to convert the Gaelic-Irish. He journeyed the whole isle, baptizing the pagans to Catholicism and actively preaching. He established monasteries, schools, and churches. He was so successful, in fact, that he severely upset the Celtic Druids and was thrown in prison several times. Every time, he escaped. Those are the recorded facts. Now what about the shamrocks and the snakes? What about the leprechauns?? According to legend, St. Patrick used the three-leafed shamrock to explain the concept of the Catholic Trinity (father, son, holy ghost) to the Gaels. As for the snakes, St. Patrick apparently put the curse of God on all the venomous snakes in Ireland. This curse drove all the snakes into the sea, where they drowned. 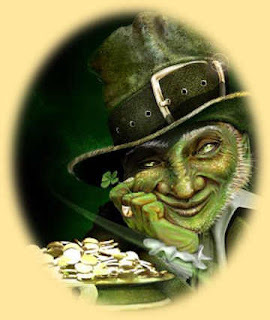 The leprechaun's name may have its origins either in the gaelic "leath bhrogan", meaning "shoe-maker" or "luacharma'n", meaning "pygmy" or "small bodied man". Either way, he is a short, cranky faerie in the Celtic tradition. Leprechauns were responsible for mending the shoes of other fairies (you can understand why they were cranky! ), but they were also known for their tricks and riddles, which they used to protect their ancient treasure (gold coins and jewels left behind by the Danes when they marauded through Ireland). Honestly, St. Patrick would probably roll over in his grave to think of his very Catholic holiday being forever linked to pagan folklore. Bishop Patricius died on March 17, AD 461 and that day has been commemorated ever since as St. Patrick's Day. Originally, the holiday was to celebrate the baptism of the Irish, however - like most holy days - it grew more secular over time. This holiday, set right in the middle of Catholic Lent (a time of repentance and prohibition), allowed the Irish a break from solemnity in which to feast and drink and dance. Actually, up to the 1970s, all that drinking and dancing had to be done at home - Irish law mandated that pubs be closed on March 17th. In 1995, the Irish government began a national campaign to use St. Patrick's Day as an opportunity to drive tourism. Personally, I think they missed the boat a little bit on that one. St. Patrick's Day had already been an international holiday for a long time! In 1962, city pollution-control workers used dyes to trace illegal sewage discharges and realized that their green dye could be put to a more entertaining use. That year, they poured 100 lbs of vegetable dye into the river. The Chicago River was green for a week. These days, for environmental reasons, only 40 lbs of dye are used and the river remains green only for a few hours. Slainte! An bhfuil tu are meisce fos? Funny. It looks like you are trying to mimic the photo above, you little elf!